I've been wanting to work remotely for years and now I finally am! I'm really excited to be working remotely from home. 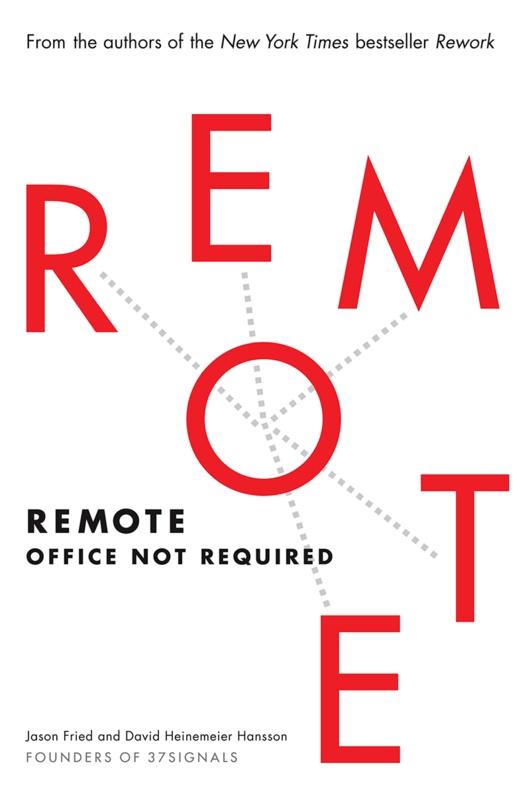 In preparation for my first stab at full-time remote work, I read what might be the most popular book on working remotely: Remote. I have heard rave reviews from my colleagues about this book over the years, so I had high expectations. Unfortunately, I was a bit disappointed in the depth of the book - it seemed to me that the authors only skimmed the surface on each topic that they covered. Perhaps my perspective is just a reflection of the fact that for several years I've been talking to people who have previously worked remotely or are currently working remotely. Because I've already heard so much about the pros and cons of working remotely, this book in the end did not contain much new information for me. A fair amount of the book was spent making the case for remote work, so perhaps that was another part of the reason why I didn't get the depth I was expecting. Despite there not being much new information for me, there is a lot of good information. I think it's worthwhile to capture the ideas that are presented. There are details about each of these ideas in the book. A page number is listed in brackets for each point. Disable automatic login on the computer. Require a password after the computer sleeps. Ensure that phones / tablets have lock codes. Ensure that phones / tablets can be wiped remotely. Just to add my own comment here, while this sounds nice in theory, I don't think that it would work in practice. At a bare minimum, an entire team needs to be remote together. Having some teams remote may also cause issues, and may require at least one team member to be in the office to represent the team. The communication mechanisms are different for remote workers, and it is easy to forget to jump on a call when most people are in the office. Culture. [68-69] Many people think of culture as the ping pong table in the break room. Culture is truly the way in which people typically act. The real culture is not influenced by location, but rather by the way in which the employees conduct themselves. Let them know upfront that communication will be virtual, not in person. Provide references before being asked for them. Show your clients frequently where you're at. They'll feel better seeing the progress you're making. Be available. For people who aren't used to working remotely, they might feel uneasy if they feel like they can't get in touch with you. Make sure that you are very available via the means you have provided for getting in touch. Involve the client as much as possible. "Working remotely makes it easier to spot managers drumming up busywork for themselves and others." Managers and meetings (M&Ms) tend to be among the biggest killers of productivity. [108-110, 176-177] There is a TED Talk by one of the authors on this topic specifically. This is a list of companies that have whole-heartedly embraced working remotely. Some of these companies are mentioned in the book, but this list of companies is not provided in the book. It is a highly related topic so I figured I would include the list here. https://weworkremotely.com/ has a list of job postings that are exclusively from companies who are posting remote positions.